Requiring A Mouse Exterminator Near Me? www.maximumpestcontrol.ca (905) 582-5502. Call Maximum For A Professional Mouse Control Service Near You (289) 396-5426. When finding mice poops in a certain place in your home or business, this should indicate to you the 1st sign where mice are most energetic in your business or house discovered. Tiny rice shape black color, around 3 to 5 mm size wise. Their filthy contaminated droppings are generally misinterpreted for rat droppings instead of the mouse. Rodent Droppings are focused near reproduction as well as nesting active premises, although they might additionally be seen in various other locations of your house periodically. their droppings Feces are likewise existing near things that have actually been destroyed by mice throughout the nesting cycle. They can be discovered in boxes that has been shredded to pieces in your basement or the outside garage, got into the kitchen cabinets, also near the house electric circuitry in the basement as well as the attic around the opening hatch. Hantavirus bacterial is acquired with the breathing of bits of infected dropping, as well as the contaminated mouse’s saliva somewhere and everywhere that can’t be seen by the normal naked eye which is important, to keep things tidy and well kept in strong sealed plastic containers. Droppings are a lot more most likely to produce infection air polluted fragments, so it is reckless to try to vacuum cleaner discovered locations and cause a dust circulation that could be inhaled easily where the droppings have actually been found in places like behind the stove, fridge, as well as under the kitchen sink were usually are most active because of the open garbage bin, without protective gloves and approved respirator that you can buy at Canadian tire so, you don’t get contracted with the contaminated bad droppings harmful dust bacteria, viruses that easily could be ingested & inhaled with your nose or open mouth the air particles of the hantavirus, that could harm us in matter of time if not taking care of contacting a pest control company nearby. 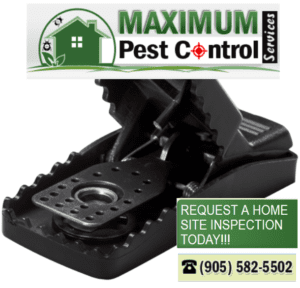 It’s very important to identify mice infestation early calling mouse exterminator near me www.maximumpestcontrol.ca (905) 582-5502 or (289) 396-5426. Let MaximumPestControlServices The Rodent Specialist Handle Your Mice Removal Service Home or Business.